(Francisco Kjolseth | The Salt Lake Tribune) BYU fans wait for the start of the game against the California Golden Bears for their NCAA college football game, Saturday, Sept. 8, 2018, at LaVell Edwards stadium in Provo, Utah. (Francisco Kjolseth | The Salt Lake Tribune) Cougarettes pose for photographs before the start of the BYU vs California game of the NCAA college football game, Saturday, Sept. 8, 2018, at LaVell Edwards stadium in Provo, Utah. (Francisco Kjolseth | The Salt Lake Tribune) BYU offensive coordinator Jeff Grimes and head coach Kalani Sitake take to the field during takes to the field before their game against California in the NCAA college football game, Saturday, Sept. 8, 2018, at LaVell Edwards stadium in Provo, Utah. (Francisco Kjolseth | The Salt Lake Tribune) BYU offensive coordinator Jeff Grimes and head coach Kalani Sitake take to the field during takes to the field before their game against California in the NCAA college football game, Saturday, Sept. 8, 2018, at LaVell Edwards stadium in Provo, Utah. (Francisco Kjolseth | The Salt Lake Tribune) BYU fans wait for the start of the game against the California Golden Bears for their NCAA college football game, Saturday, Sept. 8, 2018, at LaVell Edwards stadium in Provo, Utah. (Francisco Kjolseth | The Salt Lake Tribune) BYU offensive coordinator Jeff Grimes during takes to the field before their game against California in the NCAA college football game, Saturday, Sept. 8, 2018, at LaVell Edwards stadium in Provo, Utah. (Francisco Kjolseth | The Salt Lake Tribune) BYU offensive coordinator Jeff Grimes during takes to the field before their game against California in the NCAA college football game, Saturday, Sept. 8, 2018, at LaVell Edwards stadium in Provo, Utah. (Francisco Kjolseth | The Salt Lake Tribune) The BYU Cougars take to the field to warm up before their game against the California Golden Bears for their NCAA college football game, Saturday, Sept. 8, 2018, at LaVell Edwards stadium in Provo, Utah. (Francisco Kjolseth | The Salt Lake Tribune) DUPLICATE***Brigham Young Cougars quarterback Tanner Mangum takes to the field before of start of their game against the California Golden Bears in the NCAA college football game, Saturday, Sept. 8, 2018, at LaVell Edwards stadium in Provo, Utah. (Francisco Kjolseth | The Salt Lake Tribune) BYU takes to the field during the first half of the NCAA college football game, Saturday, Sept. 8, 2018, at LaVell Edwards stadium in Provo, Utah, against California. (Francisco Kjolseth | The Salt Lake Tribune) Brigham Young Cougars linebacker Zayne Anderson (23) almost gets his hand on a punt intended for California during the first half of the NCAA college football game, Saturday, Sept. 8, 2018, at LaVell Edwards stadium in Provo, Utah. (Francisco Kjolseth | The Salt Lake Tribune) BYU is called with an illegal touch on a punt return on California during the first half of the NCAA college football game, Saturday, Sept. 8, 2018, at LaVell Edwards stadium in Provo, Utah. (Francisco Kjolseth | The Salt Lake Tribune) Brigham Young Cougars running back Lopini Katoa (4) hurdles the California defense during the first half of the NCAA college football game, Saturday, Sept. 8, 2018, at LaVell Edwards stadium in Provo, Utah. (Francisco Kjolseth | The Salt Lake Tribune) BYU head coach Kalani Sitake argues a call during the first half of the NCAA college football game, Saturday, Sept. 8, 2018, at LaVell Edwards stadium in Provo, Utah. (Francisco Kjolseth | The Salt Lake Tribune) Brigham Young Cougars wide receiver Dylan Collie (3) is taken down by California Golden Bears cornerback Camryn Bynum (24) and California Golden Bears quarterback Ross Bowers (3) barrels in during the first half of the NCAA college football game, Saturday, Sept. 8, 2018, at LaVell Edwards stadium in Provo, Utah. (Francisco Kjolseth | The Salt Lake Tribune) Brigham Young Cougars linebacker Butch Pau'u (38) takes down California Golden Bears running back Marcel Dancy (29) during the first half of the NCAA college football game, Saturday, Sept. 8, 2018, at LaVell Edwards stadium in Provo, Utah. (Francisco Kjolseth | The Salt Lake Tribune) Brigham Young Cougars running back Squally Canada (22) misses a pass as California Golden Bears linebacker Evan Weaver (89) delivers a hard tackle during the first half of the NCAA college football game, Saturday, Sept. 8, 2018, at LaVell Edwards stadium in Provo, Utah. (Francisco Kjolseth | The Salt Lake Tribune) California Golden Bears safety Jaylinn Hawkins (6) takes down Brigham Young Cougars wide receiver Aleva Hifo (15) during the first half of the NCAA college football game, Saturday, Sept. 8, 2018, at LaVell Edwards stadium in Provo, Utah. (Francisco Kjolseth | The Salt Lake Tribune) Brigham Young Cougars running back Lopini Katoa (4) leaps over the California defense during the first half of the NCAA college football game, Saturday, Sept. 8, 2018, at LaVell Edwards stadium in Provo, Utah. (Francisco Kjolseth | The Salt Lake Tribune) Brigham Young Cougars quarterback Tanner Mangum (12) gets rid of the ball as California barrels down on him during the first half of the NCAA college football game, Saturday, Sept. 8, 2018, at LaVell Edwards stadium in Provo, Utah. (Francisco Kjolseth | The Salt Lake Tribune) Brigham Young Cougars wide receiver Dylan Collie (3) comes close to receiving a long pass as California Golden Bears cornerback Camryn Bynum (24) and California Golden Bears quarterback Ross Bowers (3) barrels in during the first half of the NCAA college football game, Saturday, Sept. 8, 2018, at LaVell Edwards stadium in Provo, Utah. (Francisco Kjolseth | The Salt Lake Tribune) Brigham Young Cougars quarterback Tanner Mangum (12) runs the ball against California during the first half of the NCAA college football game, Saturday, Sept. 8, 2018, at LaVell Edwards stadium in Provo, Utah. (Francisco Kjolseth | The Salt Lake Tribune) Brigham Young Cougars quarterback Tanner Mangum (12) looks for an opening against California during the first half of the NCAA college football game, Saturday, Sept. 8, 2018, at LaVell Edwards stadium in Provo, Utah. (Francisco Kjolseth | The Salt Lake Tribune) BYU head coach Kalani Sitake gathers his team during the first half of the NCAA college football game, Saturday, Sept. 8, 2018, at LaVell Edwards stadium in Provo, Utah. (Francisco Kjolseth | The Salt Lake Tribune) Brigham Young Cougars quarterback Tanner Mangum (12) finds his man while battling California during the second half of the NCAA college football game, Saturday, Sept. 8, 2018, at LaVell Edwards stadium in Provo, Utah. (Francisco Kjolseth | The Salt Lake Tribune) California Golden Bears quarterback Brandon McIlwain (5) gets tripped up by BYU during the second half of the NCAA college football game, Saturday, Sept. 8, 2018, at LaVell Edwards stadium in Provo, Utah. (Francisco Kjolseth | The Salt Lake Tribune) Brigham Young Cougars defensive back Troy Warner (1) moves in on California Golden Bears wide receiver Kanawai Noa (9) during the second half of the NCAA college football game, Saturday, Sept. 8, 2018, at LaVell Edwards stadium in Provo, Utah. (Francisco Kjolseth | The Salt Lake Tribune) California Golden Bears cornerback Josh Drayden (20) pressures Brigham Young Cougars wide receiver Micah Simon (13) during the second half of the NCAA college football game, Saturday, Sept. 8, 2018, at LaVell Edwards stadium in Provo, Utah. (Francisco Kjolseth | The Salt Lake Tribune) Brigham Young Cougars defensive back Dayan Ghanwoloku (5) takes down California Golden Bears wide receiver Kanawai Noa (9) during the second half of the NCAA college football game, Saturday, Sept. 8, 2018, at LaVell Edwards stadium in Provo, Utah. 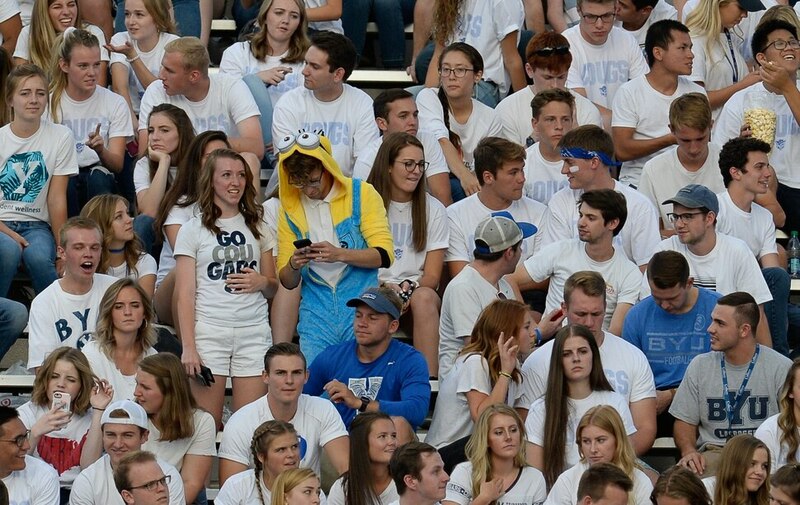 (Francisco Kjolseth | The Salt Lake Tribune) The BYU student section cheers on their team during the NCAA college football game, Saturday, Sept. 8, 2018, at LaVell Edwards stadium in Provo, Utah against California. (Francisco Kjolseth | The Salt Lake Tribune) California Golden Bears wide receiver Kanawai Noa (9) gets taken down by the BYU defense during the second half of the NCAA college football game, Saturday, Sept. 8, 2018, at LaVell Edwards stadium in Provo, Utah. (Francisco Kjolseth | The Salt Lake Tribune) California Golden Bears cornerback Josh Drayden (20) pressures Brigham Young Cougars wide receiver Micah Simon (13) during the second half of the NCAA college football game, Saturday, Sept. 8, 2018, at LaVell Edwards stadium in Provo, Utah. (Francisco Kjolseth | The Salt Lake Tribune) BYU offensive coordinator Jeff Grimes leaves the field after a 21-18 loss to California following the NCAA college football game, Saturday, Sept. 8, 2018, at LaVell Edwards stadium in Provo, Utah. (Francisco Kjolseth | The Salt Lake Tribune) The BYU student section cheers on their team during the NCAA college football game, Saturday, Sept. 8, 2018, at LaVell Edwards stadium in Provo, Utah against California. (Francisco Kjolseth | The Salt Lake Tribune) California Golden Bears wide receiver Kanawai Noa (9) is pulled on by Brigham Young Cougars defensive back Dayan Ghanwoloku (5) during the second half of the NCAA college football game, Saturday, Sept. 8, 2018, at LaVell Edwards stadium in Provo, Utah. (Francisco Kjolseth | The Salt Lake Tribune) BYU offensive coordinator Jeff Grimes coordinates his line during the second half of the NCAA college football game, Saturday, Sept. 8, 2018, at LaVell Edwards stadium in Provo, Utah. (Francisco Kjolseth | The Salt Lake Tribune) BYU fans cheer on their team as they battle California during the second half of the NCAA college football game, Saturday, Sept. 8, 2018, at LaVell Edwards stadium in Provo, Utah. (Francisco Kjolseth | The Salt Lake Tribune) Brigham Young Cougars quarterback Tanner Mangum (12) yells to his team during the second half of the NCAA college football game against California, Saturday, Sept. 8, 2018, at LaVell Edwards stadium in Provo, Utah. (Francisco Kjolseth | The Salt Lake Tribune) BYU fans cheer on their team as they battle California during the second half of the NCAA college football game, Saturday, Sept. 8, 2018, at LaVell Edwards stadium in Provo, Utah. (Francisco Kjolseth | The Salt Lake Tribune) California Golden Bears safety Jaylinn Hawkins (6) pulls in a pass intended for Brigham Young Cougars wide receiver Akile Davis (1) during the second half of the NCAA college football game, Saturday, Sept. 8, 2018, at LaVell Edwards stadium in Provo, Utah. (Francisco Kjolseth | The Salt Lake Tribune) Cosmo gets the fans excited during the second half of the NCAA college football game, Saturday, Sept. 8, 2018, at LaVell Edwards stadium in Provo, Utah. (Francisco Kjolseth | The Salt Lake Tribune) Brigham Young Cougars running back Brayden El-Bakri (35) carries a touchdown against California during the second half of the NCAA college football game, Saturday, Sept. 8, 2018, at LaVell Edwards stadium in Provo, Utah. (Francisco Kjolseth | The Salt Lake Tribune) Brigham Young Cougars running back Squally Canada (22) carries the ball against California during the second half of the NCAA college football game, Saturday, Sept. 8, 2018, at LaVell Edwards stadium in Provo, Utah. (Francisco Kjolseth | The Salt Lake Tribune) The BYU fans are pumped up during the second half of the NCAA college football game, Saturday, Sept. 8, 2018, at LaVell Edwards stadium in Provo, Utah. (Francisco Kjolseth | The Salt Lake Tribune) Black Hawk helicopters pass the stadium at the start of the BYU California game during the NCAA college football game, Saturday, Sept. 8, 2018, at LaVell Edwards stadium in Provo, Utah. Provo • Official notice: BYU is wearing hardhats, searching for, trying to build an offensive identity. Two games in, construction delays are all around. The name has not been found, a complimentary label has not been established, the mystery has not been solved. The closest thing that has arisen so far is this: The Cougars are a bunch of plodders, grinders, toughies. All of which is a euphemism for an offense that has some talented players, but a dearth of real playmakers. And as BYU was reminded here late Saturday night in its 21-18 loss to the Cal Bears, it’s hard to count on repeatedly putting together 12-play drives for touchdowns — without something going wrong. Better to help the effort with a breakaway here and there. Breakaways require speed, and BYU’s offense has almost none. A big play on defense, though, gave the Cougars hope — a 36-yard scoop-and-score off a fumble taken by safety Dayan Ghanwoloku that cut a third-quarter deficit to 14-10. Ghanwoloku also recovered a fumbled punt in the fourth, giving the offense a chance to score, a chance that ended up unrealized. Overall, the defense played decent. The offense? What’s the word … indecent? Kalani Sitake, in so many words, called it goof-prone. He specifically mentioned dropped passes and too frequent ineffective offensive line play — including weak blocking on runs and poor pass protection. “There’s enough blame to go around,” he said. Before the Cougars played their first game, Sitake was asked how often his offense would throw the ball versus running the thing. After playing mostly power football, with a few zigs and zags and timely passes tossed in, against Arizona in their week-one win, the Cougars attempted to go back to power football in week two against Cal, and then, they went away from it, and then, they went back to it, and then ... .
And then, they picked up only a handful of second-half yards against the Bears and lost. Sometimes the running helped them, and sometimes it did not. Sometimes the passing helped them, and sometimes it did not. Usually, neither did — against a Cal defense much better than Arizona’s. In a season of great importance for BYU football, though one of reduced expectations, it is compelling stuff watching the attempted establishment of an entire new offense for a program that can trace and attribute its only sustained successful stretch of football to years of explosive attacks. That legacy has ebbed in recent years, piling up in a heap last season. New offensive coordinator Jeff Grimes is trying to clear that now with an offensive signature that, at least at times, harkens back nearly a century — to the leather-helmeted, raccoon-fur-coat-wearing, pennant-waving, gold-fish-swallowing football style of the 1930s. Line up your big’uns against the other guy’s big’uns and see who can get work done. As mentioned, that worked versus last week’s Wildcats, when BYU went to the ground 43 times against just 28 passes. 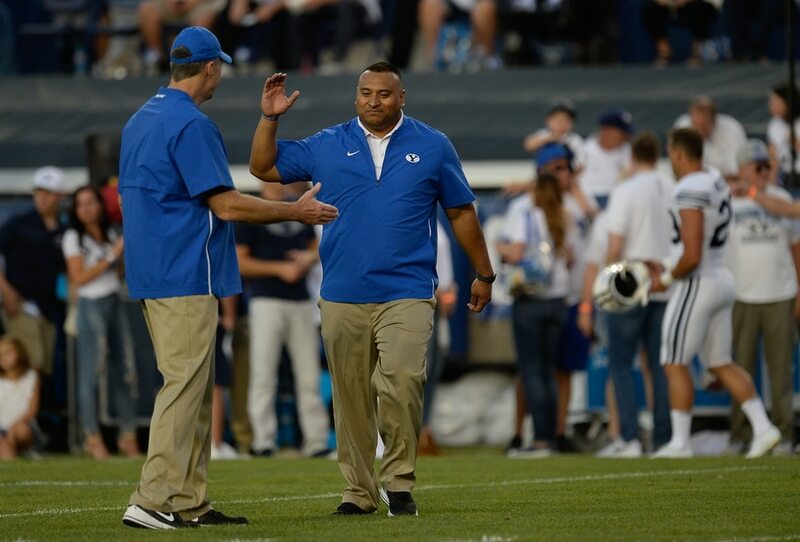 Even with that methodology, running down its venue to victory, you had to wonder if the Cougars really could, as Sitake had said, change it up enough to go all newfangled again, when necessary. Against Cal, the Cougars gained some advantages powering ahead with Squally Canada, who had a few strong runs. But when they went to the air, there were too many disruptions in their consistency. Just one example: BYU made a move down the field for a shot at taking a late halftime lead, threatening to go up, 10-7, but two different Cougar receivers — Dylan Collie and Micah Simon — dropped huge passes. “Dropping the ball doesn’t help,” Sitake said. In the third and fourth quarters, inconsistencies continued to plague the Cougars, spinning into a messy swirl. The O did manage one late TD and a 2-point conversion. It gained a total of 287 yards. As for building that identity, heading into week three against Wisconsin, there are orange barrels all over the place on BYU’s bumpy road to offensive recovery. GORDON MONSON hosts “The Big Show” with Jake Scott weekdays from 3-7 pm. on 97.5 FM and 1280 AM The Zone.y.